The breed became established there and achieved considerable regard as a producer of highly-rated meat in the markets at Lyon and Villefranche in the 16th and 17th centuries. In 1864 a herd book was established by Conte de Bouillй in Nevers for the Nevers-Charolaise breed. Another herd book was started in 1882 in Charolles. They were combined in 1919 as the Charolais herd book. The breed attained international importance after World War II. 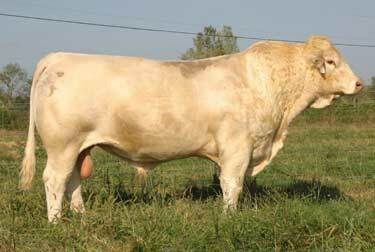 Charolais are medium to large framed beef cattle with a very deep and broad body. Their color is white to cream with a pink muzzle and pale hooves. They have a short, broad head and heavily muscled loins and haunches. Charolais have demonstrated a definite superiority in growth ability, efficient feedlot gains and in carcass cut-out values. With excellent meat conformation, especially of the valuable parts and relative late maturity they are well suited to fattening for high finished weight. They are well suited to all purpose cross breeding.